When zooming in, the clusters automatically divide into smaller groups, until at a certain point individual objects will be displayed. The icon color of the object provides information about the objects current state. The object did not did not send data for a specific time interval and is inactive. The object is active and moving in the displayed direction. The object is idling (ignition on, not moving). The object is parked with ignition off. The object's ignition is blocked. 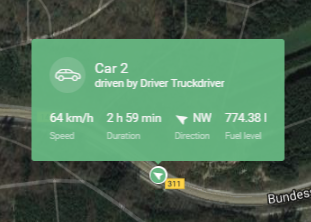 Driving, rest and work state duration (if the Time analysis functionality is used). 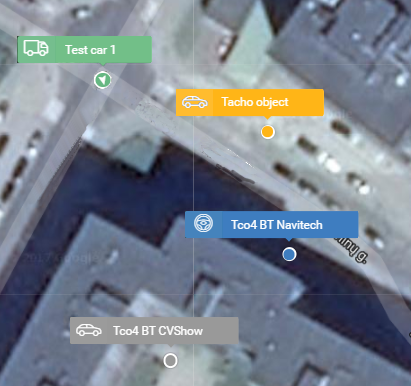 The user can generate a shareable link with the vehicle’s location by clicking the link icon as shown in the image below. Link generation is described in the “Fleet status menu” section. 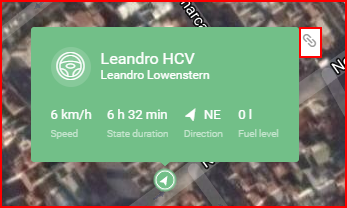 Clicking on the vehicle will open the vehicle overview panel on the left side of the screen. This is panel is described in the “Fleet status menu” section.